We live in a world where youthfulness rules – at least the look of it anyway. There are many things we can control in our daily life, what to wear, who to hang out with, where to go for dinner, but when the signs of aging start to show up (and sometimes much sooner for some of us) it can be incredibly discouraging – especially when it starts to show up on our face and we notice it every time we look in the mirror! I remember when I first started NOT getting ID’d at bars and restaurants for drinks. Ugh, that means I at least look 35. That was not a good feeling. Another super discouraging moment was at the tender age of 27 when my first nasty sun spot showed up – and in the shape of a mustache no less! I wanted to cry and hide myself from the world. Unfortunately in a nation where beauty and youth are everything, it can be extremely hard to not play into this, even when many of us are leading fulfilling lives with amazing successful careers, loving families, and finally obtaining the vacations, and material goods and homes we’ve always dreamed of! It’s unfair to think that you finally start living, only to have your face show the world you’ve been indeed living well past your 20s! While I hate to place confidence on beauty, and luckily many of us who reach our 30’s and 40’s are no longer placing as much value on this, as women, most of us will still find some sort of self-esteem and confidnce in our looks (or the lack thereof), even as we age. I’ve seen in my own life and the life of my friends and family how suddenly a huge event can take place that can immediately change your thoughts on your looks and make the skinnier body and more youthful looking face more of a priority. Like for instance, the young beautiful intern that shows up at work and all of a sudden we notice how all the men in the office are paying attention to her. Or perhaps, a good friend is cheated on by a husband who went after the younger girl. It’s happened to many of us, unfortunately, and it can be extremely earth-shattering when it does. Aging beauty can still be beautiful but it doesn’t mean we have to settle for something we don’t like looking at in the mirror. For me, it’s always been my sun spots. Gray hairs are easy to cover up, even in your late 30’s I’ve found as long as you keep up on the workouts and eat right (a healthier, more plant based diet) you can keep the body pretty tight and toned. But evening out skin tone can be much trickier and as for a newly single woman, I’m finding myself more concerned with this issue of what a long summer in the sun has done to my face. What can I say, I worship the sun and have all my life, and unfortunately at 38, it shows! I’ve know now as a beauty blogger, that while many skin creams won’t make much of a difference, there are certainly others that do! Especially when used in conjunction with an at-home beauty device, you can get similar to what you’d find in a dermatologists office! The Jelessi Torche and Jelessi HD2 Hyaluronic Duo are just that- a very powerful turn-back-the-clock antiaging duo! You have probably heard of Hyaluronic acid showing up a bunch lately in many beauty products, and it is for good reason! Hyaluronic acid holds 1000x it’s weight in water, so you’re going to get incredibly moisturized and hydrated skin when you use it! I have super dry skin and live in a super dry desert like climate here in Utah, and my skin needs something powerful to keep it hydrated and Hyaluronic acid is it! I’ve been using it for a few years now and have been amazed with how much softer and supple my skin is- which in turn makes wrinkles and fine lines less noticeable too! What makes the Jelessi HD2 duo different from other hyaluronic creams on the market, is that it uses a unique formula you won’t find in any other skin creams out there, that not only moisturizes and hydrates the skin, and minimizes the fine lines and wrinkles too, but it also has an amazing combination of ingredients, including hyaluronate, sodium citrate, resveratrol, coconut extract, and vitamin E, that gives skin a flawless photo finish! This cream actually works to even out skin tone and fade away skin imperfections such as my dreaded sunspots, scars, acne scars, and more! It also helps restore and improve collagen and elastin in the skin, giving it a tighter, more lifted youthful appearance. This all-in-one skin cream does it all! It’s a powerful addition to any skincare routine that will make a difference in skin and really quick too! My skin looked immediately more noticeably soft, smoother and brighter after the first use! It has a way of making the skin look completely flawless too! Skin looks photo ready without makeup! You’ll pay a little more for this skin cream than most, but I’m telling you, it’s well worth it! Plus a little goes a long way, so you won’t need much of it and will last you longer than most skin creams too! Along with using my Jelessi HD2 Hyaluronic day and night cream duo each morning and night, I also used it in conjunction with the Jelessi TORCHĒ V2+ Amber Light. This powerful at-home anti aging beauty device emits both Amber LED light and heat technology, and when these two components are used together, you end up with a powerful combination that reduces the appearance of oil stabilization, brown sunspots, inflammation, and reduced pore size too! With extended use (it is recommended to use for at least four weeks, 4-5 times a week), skin awakens and looks fresh, clean, and has an amazing youthful glow to it as well! The device is easy to use but can take a few minutes depending on which areas of the face you’d like to target. There are three major zones, the cheeks, forehead, and eye area. Each area should be treated for 3-5 minutes after cleansing for 4-5 days a week. Use both the heat and LED mode, and apply light pressure and gently massage skin and keep the wand moving in circular motions while working the zone, and finish with skin cream. Watch the video to see it in action HERE! This non-invasive extremely innovative device in gentle and safe and great for all skin types, including sensitive skin. It comes with a LIFETIME warranty too, so you know you’re getting exceptional quality! I’ve found it extremely easy to use. Sure the device takes about 20 mins to hit all the zones, but I found I could easily watch TV while using it, listen to a podcast or just relax in my bed. The Torche is super relaxing and the heat and massage feels so nice on the skin, it’s incredibly relaxing and I found myself looking forward to using it each night before bed! After just a few uses, I noticed how much smoother and softer my skin felt. In fact, I could easily tell while using the device. The first couple times I used it, my skin would dry up immediately after washing and get tight and I’d have a harder time gliding the device on my skin, but after only a few sessions, my Jelessi Torche began gliding across my skin so much more easily! My skin had already become noticeably softer! 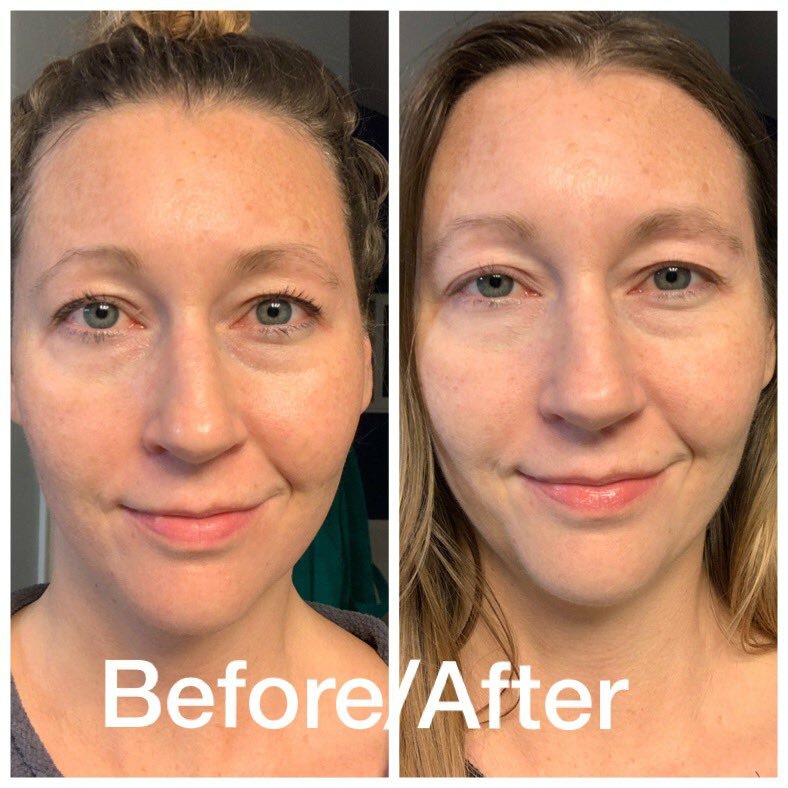 While I have dry skin and not oily skin, I didn’t really get to test out the oil -minimizing feature of this awesome skincare tool, but I do have red inflammed skin from time to time and quickly noticed my skin looking less red and much more even in tone. My skin also started to look much more fresh and has a nice glow to it too! You’ll notice that right after using the device, skin will be a little red, but after a few minutes the redness fades and you’re left with beautiful glowing, illuminated skin that is photo ready! The biggest difference I noticed was the sun spots. My sunspots are absolutely fading quickly with my Jelessi Torche! I have a lot of sun spots around the temples and my cheeks, and as you can see from the before and after photos I’ve taken, my skin tone is looking much more even and the sunspots are now hardly noticeable, especially around the temples and forehead. I can also tell that the red inflammation isn’t as noticeable, especially around the nose, inner cheeks, and upper lip if you look closely at the picture below. My under eye circles also don’t look quite as prominent too! And be sure to check out all the 5 star reviews from Jelessi’s incredibly satisfied customers! Jelessi also has more amazing devices and products to help reduce the signs of aging in the neck and around the eyes, as well as a device specifically designed to reduce the appearance of fine lines and wrinkles! Oh, and the packaging is AMAZING! Some of the best I’ve ever seen! Be sure to follow Jelessi on Instagram and Facebook to stay up to date on all things Beauty and Anti-Aging! This looks like something I’d really like. My skin has gotten dry and dull recently. I need all the help I can get at my age. I too have dry skin. Wow! Those are amazing results. Thanks so much for your before and after! I would like to try this. I have really dry skin in the wintertime. Wow! This looks like it really does make a worthwhile difference! Thanks for this review! Thanks for the info. Seems like it works well. That seems interesting, I’ve recently turned 30 and started noticing more sunspots and lines that I better tackle as soon as possible, it’ll definitely be an option! Ok this looks & sounds AWESOME! I would seriously love to try this out for sure! This sounds like an amazing product! Id love to try it. This sounds amazing. Thank you for sharing. I would love this as my skin is getting old. The results are great and looks like something I need for my aging skin. This sounds great and I am going to have my hubby get me one for my birthday. At 53 I am all about reversing the clock. I think most of us worshiped the sun in the 60’s and 70’s. We just didn’t understand the dangers. The older I get, the dryer my skin gets. I’d love to try this. Those are amazing before and after pictures. I have sunspots too. I have wondered what I might do to lessen the visibility of them. This is definitely worth thinking about. Thank you for the informative article. I am always look for a products that works. A bit expensive, but the results look good. At 55 my face is showing my age, what I wouldn’t give to look 10 years younger. This looks like it would really work. i have to accept the facts that i am 40 and try something like this! I’d like to give this a try. My dry skin needs a lot of help. I need to try this. You look fantastic. Yes I need to try these all. Anti Aging has me all over it between lines and circles from being stress tired and wearing a apnea mask ! I need this. I am going to look into this. Looks like a very luxurious product. Thanks for sharing. Would love to try this. Thank you. The results look good, but I also think you’re too hard on yourself. You looked great in the “before,” too. It drives me nuts that aging is seen as such a sin. To be honest, I don’t think most people are judging others all that harshly, and the ones who do are shallow and not worth my time, anyway. Not to say that I don’t do what I can to look my best — I’m 53 — but I’m also not going to spend as much as this product costs. I’m pretty happy with my drugstore hyaluronic acid product (the brand starts with an “N” and is four syllables). Be kind to yourselves, amigas! Beauty is not just skin deep. This looks awesome!! You can see the difference in your before and after photos. I’m always looking for products that will help keep my skin looking as young as possible. This is way too expensive for me. More than $3,500! This would be great to try. I need all the anti aging I can get. I am always looking for something to brighten my skin! I am 52 and haven’t found the right product yet…this looks like it would do the trick! I still havent found skincare products I love. These sound like they would be worth a shot. Thanks for posting about them. I won a cream and serum from Vine Vera that has resveratrol and they are really nice products. The Jelessi sounds like another nice product with the combination of resveratrol and hyaluronic acid. I would love to try this product. I can’t really splurge on myself like that though. This looks amazing, and I could really use it too. I can see a difference in the before and after photos! This looks like it really works! This looks like something I could benefit from since my skin is really dry in the wintertime. WOW! The Hyaluronic acid made a huge difference on your skin. I have to try this! I love the results you got! Id totally try this and show it to my family! I have been told that I do not look my age and am up to trying any product that will help keep it that way – LOL! I’ve been daydreaming and wishing on stars to get an anti-aging device much like this one for at home use. I like how convenient it is and easy to use too. Professional treatments of any kind is not something in our budget so nothing like that will ever happen, but maybeeeee if I am really lucky I still hold on to hope I might be able to get something like this someday over the rainbow. Incredible products. Would LOVE to try them!!! I could use 10 years off my face! Seems like one could get some good results with this. wow. Less expensive than plastic surgery. Something to think about. This looks like a interesting system. Holy Moly,im 52 and id love to give this stuff a try,the instruments look simple to operate and the before and after pics really show a big difference,what a great beauty breakthrough. It looks so easy to use. I could definitely use this! I can’t do anything about my actual age, but not looking my actual age would definitely be nice! This would be awesome! It would be great to resemble 28 again! I think this would be great to try out. Anything that helps my dull skin is good by me. I am 54 and most definitely need this! I am looking for anti-aging products that truly work well. I’d love to try this out on my combination skin! I would love to try out this product. I turn 40 this year and totally see the effects the sun has done on my face. This is awesome. But like a lot I can’t afford this at this time. Sounds amazing though. OMG, if this product could really produce these kinds of results, I’m totally in! I can’t do anything about my age, but being able to do something about the age I look is a game changer! I’ve never heard of this product before. I’d love to try it, my skin could use some help. I am impressed with the difference! You look so fresh and lessor bags under your eyes…Impressive! Love anything that helps any aging. I would love too have this due to oily skin and hot flashes that start on my face, then my head,and next my back. Looks like a good product to try out. I so want to try this. I need to see how much it can do for me. Sounds very nice. I would love to try this product. You got great results! I love anti aging products that actually work. This sounds so amazing. It’s easy to see the results in your before and after pictures too. I think the results are terrific. Looks like you got some good results. I would love to try this because my skin has been dry and dull looking. I would love to try this because my skin has been dry and dull looking. This stuff sounds awesome. I’d like to get this for my grandma to try. I would love to try this brand out. I would so love to try these products. I need to pay for all that fun in the sun I had when I was younger. We all need help at a certain age, I’m a that certain age. Interesting, will be looking into this. Good post. Looking for some anti-aging skincare, so this is helpful! These products NEVER break my skin out! I adore them.